Today is Tuesday, June 13, the 164th day of 2017 in the Gregorian calendar, with 201 days remaining. Donald Trump has been President of the United States for 145 days. There are 1,318 days remaining in his term, assuming he doesn't resign or is otherwise removed from office. 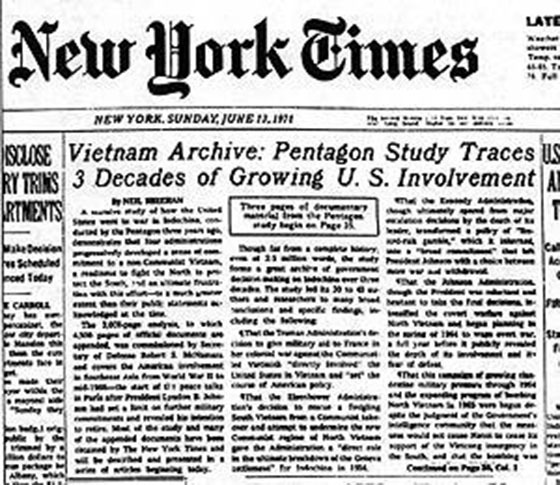 On this day in 1971, The New York Times began publication of The Pentagon Papers. The papers revealed that the U.S. had secretly enlarged the scale of the Vietnam War with the bombings of nearby Cambodia and Laos, coastal raids on North Vietnam, and Marine Corps attacks, none of which were reported in the mainstream media. The papers were released by Daniel Ellsberg, who had worked on the study. Ellsberg was initially charged with conspiracy, espionage, and theft of government property, but the charges were later dropped after prosecutors investigating the Watergate Scandal discovered that the staff members in the Nixon White House had ordered the so-called White House Plumbers to engage in unlawful efforts to discredit Ellsberg. Among other things, today is also National Kitchen Klutzes of America Day. Florida man with machete orders man to steal beer. "Man can embody truth but he cannot know it." Really smart people have had some really bizarre habits. I feel much better about myself now. Johnson & Johnson's Invokana prevents heart attacks but increases risks of amputated toes. For every three heart attacks, strokes, or cardiovascular deaths prevented by Invokana, there were two amputations, 71% of them of toes or the lower foot, according to the results of the 10,142-patient study, which was funded by Johnson & Johnson. It is being presented at the annual meeting of the American Diabetes Association tonight, and published by the New England Journal of Medicine. Bill Cosby's defense case was roughly as long as the first commercial break on a late night talk show... about six minutes. Cosby didn't testify. Senate Republicans reportedly won't release the draft of their health-care bill to replace Obamacare. No hearings, either. Majority leader Mitch McConnell wants the bill passed before the July 4 recess. If it is, it'll go back to the House, where heaven knows what further indignities will be foisted upon us. It would appear that It would appear the Affordable Care Act (Obamacare) is in deep trouble. U.S. power companies warned Russian 'nightmare' cyber weapon already causing blackouts. The computer code, dubbed "CrashOverride” by Maryland-based Dragos, and "Industroyer" by ESET in Slovakia, is a genuine cyber weapon that can map out a power station’s control network and, with minimal human guidance, issue malicious commands directly to critical equipment. Only once before has the world seen malware designed for such sabotage, with the 2010 Stuxnet virus used against Iran’s nuclear program. CrashOverride is the first to target civilians and the first such malware built to target a nation’s power supply. Eureka? Yes, Eureka! Forget Zuckerberg. Fifty-five years ago this week, Rachel Carson published the first part of "Silent Spring" in The New Yorker. Carson exposed, in detail, the dangers of the pesticide DDT; her work jump-started the American environmental movement and helped bring about the creation of the Environmental Protection Agency. The importance of Adam West's 'Bright Knight' Batman: He helped save Batman and changed what was possible with DC Comics' Dark Knight Detective. How Adam West made peace with life and career after his iconic 'Batman' role. Dr. Olivia Doll sits on boards of seven international medical journals. She's also an Australian dog named Ollie. The dog's academic career was created by Professor Mike Daube from Curtin University, a public health expert in Perth. He wanted to expose the predatory practices of some scientific magazines, which charge fees and do not go through a rigorous vetting process, looking to take advantage of researchers. Universal mathematics: the spooky uniformity of life on Earth. We're all scaled up or scaled down versions of each other. More or less. Pig brain cells implanted into brains of people with Parkinson's. The hope is that compounds made by these cells will nourish the remaining dopamine-producing cells in the patients' brains, slowing further loss. New record set for world's fastest elevator. Chinese elevator goes up at 44.7 miles per hour (65.56 feet per second). It descends at 22 miles per hour (32 feet per second), on supposes, to prevent people from screaming. We need to talk about the power of AI to manipulate humans. Our tendency to become emotionally attached to chatbots could be exploited by companies seeking a profit. How The Intercept outed Reality Winner. Most new printers print nearly invisibly yellow dots that track down exactly when and where documents, any document, is printed. Because the NSA logs all printing jobs on its printers, it can use this to match up precisely who printed the document. Trump lawyer won't rule out firing special counsel in Russia probe..
Attorney General Sessions to talk publicly to U.S. Senate panel. Sessions will likely face tough questions at the open Senate Intelligence Committee hearing over his dealings with Russian officials during the campaign and whether he had a role in the firing of former FBI Director James Comey. Trump hotels not tracking foreign cash despite Trump promise. D.C., Maryland to sue President Donald Trump alleging breach of constitutional oath. The lawsuit, the first of its kind brought by government entities, centers on the fact that Trump chose to retain ownership of his company when he became president. President Trump held a Cabinet meeting, and it was weird. Unqualified (and unearned) praise for Trump. This is probably what a North Korean cabinet meeting is like. The Ninth Circuit deals Trump travel ban another defeat and cites his Twitter comments. You'd think he'd learn to dummy up by now. Looks like the next stop is the Supreme Court. Donald Trump, Jr. appears to corroborate Comey's version of the Oval Office meeting with Trump. Junior tells Fox News Dad did tell Comey to let Flynn off the hook. The Covfefe Act has a silly name- but it addresses a real quandary. The bill amends the Presidential Records Act to include the term "social media" among the materials that are documented, "ensuring additional preservation of presidential communication and statements while promoting government accountability and transparency." Which means... Trump can't delete his tweets? Trump gives Priebus until July 4th to clean up White House. The president has threatened to oust his chief of staff if major changes are not made, but many are skeptical he'll follow through. Trump-like 'Julius Caesar' assassinated in New York play. Delta, Bank of America pull funding. Frankly, I think the actor looks more like Conan O'Brien. The play "takes onstage Trump-trolling to a startling new level," said a New York Times review entitled "Can Trump Survive in Caesar's Palace?" The New Yorker offered this defense. And nobody seemed upset about a 2012 Obama-themed version. Expect comedian Roseanne Barr to tackle Donald Trump and the current reality of ordinary Americans when a revival of her popular family sitcom debuts on ABC mid-season. Unless they do it live, I don't see how a scripted/recorded series can possibly try to stay current with the events in Trump land. I know stuff I publish at midnight is often outdated before it hits the website or email boxes of subscribers. The eight-episode revival will ignore the fact they killed off John Goodman's character in the original series. Trump faces 'put up or shut up' moment over possible secret tapes. So long, Trump Tower. First lady Melania Trump and son Barron moved into White House. And they look thrilled. Trump's deputy press secretary tweeted pure gibberish. The world was ready. Multiple transit projects across U.S. at risk as White House infrastructure plan falters. Here in Pittsburgh, the Transportation Department tells us we're out of luck. More than 50 projects across the country could be affected. Trump is likely to get much, much worse. Here are a few big things to watch for. CNN canceled Reza Aslan's show "Believer" after profane anti-Trump tweets. Aslan has been a virulent critic of Trump for some time, but this particular tweet crossed a line in the minds of some media critics. Prominent conservatives weighed in and said they wanted Aslan to be fired. He had called the Trump "a piece of," er, excrement.